Why Should You Seal Coat? Seal coats provide a waterproof surface, preventing moisture from entering, then weakening the asphalt. Our high quality seal coat provides the ultimate in protection against all weather conditions. Without our high quality sealant, your asphalt is more vulnerable to penetration by water and ice which can cause cracks and other damages. Resists gas and oils which soften, weaken, and ultimately destroy the overall integrity of asphalt pavement. Seals against moisture accumilation in blacktop which can severely damage pavements under the “freeze-thaw” cycle. Shields against the drying action of the sun, which causes raveling and cracking of the pavement and allows water penetration. Beautifies asphalt pavements by providing a charcoal black color which gives the pavement a rich, new-look appearance. We use only the highest grade seal coat in the business. Seal coating will prolong the life of pavement indefinitely at a fraction of the replacement cost. Utilizing only the highest grade seal coat ensures that your pavement will be protected against Alaska’s harsh elements. A permanent repair to damaged asphalt. This type of repair is more than just a “patch”, but a seamless bond between the repaired area and the surround asphalt. This process is done through a thermal infrared process that once cooled- the repaired area sticks to the adjacent asphalt like glue. The result is a long lasting bond in which the project is finished faster with fewer raw materials. Cracks are usually caused by either a failure of the base, water damage, or excessive weight on the pavement surface. Cracks can easily be repaired by installing a hot pour material to fill them. The crack sealer provides a waterproof bond and is rubberized to give support while the pavement expands and contracts in changing temperatures. Cracks that go unsealed will continue to allow water into the base structure, causing severe damage to the pavement as the base deteriorates. A pavement crack inspection and correction should be done annually. A fairly new concept to the seal coat market. This is a great way to protect and beautify your asphalt pavement. It is ideal for driveways, parking lots, roadways, walkways, golf cart paths, patios, or any other asphalt surface area. Color seal coat provides a durable, long lasting finish that will enhance the overall appearance of any property. The seal coat is available in nine standard earth tone colors to meet all your needs. Layout and paint permanent pavement markings with Alaska Department of Transportation approved traffic paint. We offer industrial grade pressure washing that is most commonly used to prepare pavement for residential jobs. Power washing helps to remove dirt, weeds, grass and debris from asphalt. Street sweeping is often used for large commercial jobs. Street sweeping and pressure washing is done to prepare your asphalt for seal coating and to ensure a clean surface for optimal adhesion. We treat all Oil and Gas stains with degreaser and apply a pre sealer before any seal coating. 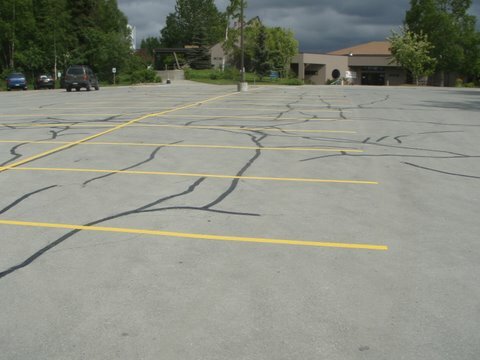 For asphalt that has deteriorated due to oil or gas stains may need to be replaced. During Alaska’s icy winters we offer sanding services throughout the Anchorage area. In addition to sanding, we also offer ice melting for any commercial or residential area. Alaska Quality Seal coat provides professional and reliable snow removal services twenty-four hours a day, seven days a week. Our services include both residential and commercial snow removal. We pride ourselves on meeting our clients individual service needs. How long do I need to wait to sealcoat my new repairs? For best results, wait at least 1 month before applying a coat of sealer (repair area will blend better with the surrounding asphalt). Can you use Infrared process to pave my whole driveway? If the driveway is 16’x 18’ or less, Infrared may be an option. It would probably be half the price of repaving, but will not be the same quality. Whole driveways are usually better off being re-paved leaving the whole surface in a uniform manner, with all of the asphalt rolling out of the paver in the same direction (smoother surface). Every repair process has seams, what matters is whether the seam is a cold joint or a hot joint (thermally bonded). Even new driveways have seams – everywhere a joint is matched, there’s a seam. Every saw cut repair has a cold joint – this joint is a point of weakness that will always open up. The perimeter of the repair is saw cut, asphalt is removed and hot asphalt is installed against the cold edge of the surrounding asphalt. The two surfaces never bond and eventually separate. Infrared repairs are thermally bonded – the asphalt is heated just beyond the repair area, allowing the repair area to become part of the surrounding asphalt. Without cold joints, there is no point of weakness. Are Infrared Repairs a good option for me? If you have a few bad areas that can’t be crack filled, they may be candidates for Infrared Repair. It’s usually not cost effective to repair single cracks; but alligatored cracks, settling and potholes are problems often repaired with Infrared. As a rule of thumb, if less than 20% of the drive has issues it may be worthwhile to use the Infrared process. If most of the drive is in poor shape – we recommend ripping up the whole thing and re-paving, if you have a few problem areas – Infrared may be a good option and if the asphalt only has minor cracking we recommend hot crack sealing and sealcoating. Won’t it blend in after a sealcoat? It will blend better with a sealcoat (same color), but the textures will still be different and the repairs will be visible. Asphalt surfaces that have only been sealed a few times can eventually blend in pretty well with a few sealcoats, over a few years. If a new driveway is what you’re looking for, you’ll need us to rip out and replace your driveway with new asphalt. Infrared repairs are a nice option if a large portion of your asphalt is in good shape and you can accept that the repairs will not be invisible. Will I see the Infrared Repairs after they’re done? Yes – it’s impossible to match old asphalt using new asphalt, even with infrared repairs. How well a repair blends with the surrounding asphalt depends on one main factor, how many times the surrounding asphalt has been sealed. Each time you sealcoat your asphalt, the voids between the aggregate get filled in a little more. The more times a driveway has been sealed, the less texture it has, leaving little chance it will match up with new asphalt that has more texture. Just imagine your old driveway next to a new driveway, that’s the difference you will see. Why should I consider Asphalt Restoration for my asphalt repairs? Because it leaves a seamless asphalt patch that will last longer. Our Crew Members are experts in Infrared Repair and have probably handled the same type of problem you have multiple times just this week. In addition to the experience, our Crews take great pride in the work they do and are truly craftsman that have developed many of their own techniques over the years. Yes – we accept Visa, MasterCard, Discover & American Express. Do I need to give a down payment? No – we’re confident in our work and believe after you see the repairs, you will want to pay us. We like to offer the peace of mind that comes with not paying until you see the finished product. Do you offer color sealcoating? Alaska Quality Sealcoat offers 12 different colors of 100 ‘/, acrylic based sealer making it more oil and gas resistant. Please contact us today for more details or for a free estimate. How long does your seal coat last? All jobs wear differently, so on average our two-coat seal coat application should last you around 3-4 years. Cracks however should be addressed yearly. How long do we need to stay off the asphalt once sealed? We apply a two-coat application, once the second coat has been dried completely, we recommend keeping all vehicles off for 48 hours. Foot traffic is allowed once the sealer looks dry. What kind of sealcoat do you use? We use a product called Armor Seal A-100HD which is a concentrated asphalt and clay base sealer. We also add silicone sand to our product for longevity. Other additives are available if requested. © 2017 Alaska Quality Sealcoating.